I had some leftover cinnamon butter in my fridge from making Snickerdoodle Bread. Not enough to make a full recipe of anything really, so I’ve been pondering how to use it. Then I thought of something I saw a while ago (on Pinterest…yes, all good ideas come from there it seems). 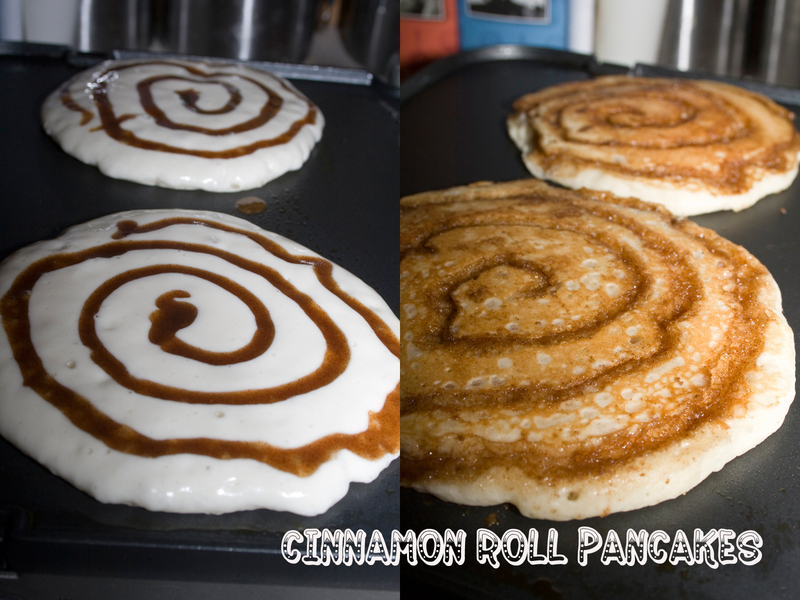 After eating these cinnamon roll pancakes, my kids declared that I am “the best Mommy in the whole world”. So, that pretty much made my day. Even if it was a result of buttery goodness on their plates. If you make the cinnamon butter the night before and pop it in your fridge, these pancakes won’t take any extra time in the morning. Just pop it in the microwave to soften it to a drizzling consistency and then swirl away. I used a ziploc baggie with the end snipped to swirl mine. The big bonus for me is that instead of messy syrup which always ends up EVERYWHERE, my kids got a homemade cinnamon swirl that cooks right into the breakfast so there’s no sticky mess! You can use your favorite pancake recipe if you’re making these for a Sunday brunch or if you are crunched for time, just whip up a batch of Krusteaz and make it special with the addition of that gorgeous cinnamon butter. You will LOVE these. Yum! In a saucepan over medium high heat, melt the butter. Add in the brown sugar and whisk, bringing it up to a boil. Let it boil for about one minute, remove from heat, and whisk in the cream. Add the baking soda and cinnamon and whisk until combined. Set aside to cool slightly. Or, place in the fridge until ready to make pancakes. Put cinnamon butter into a ziplock bag and snip one corner (microwave if necessary to bring to liquid consistency). Combine ingredients for pancake batter and dollup on hot griddle. 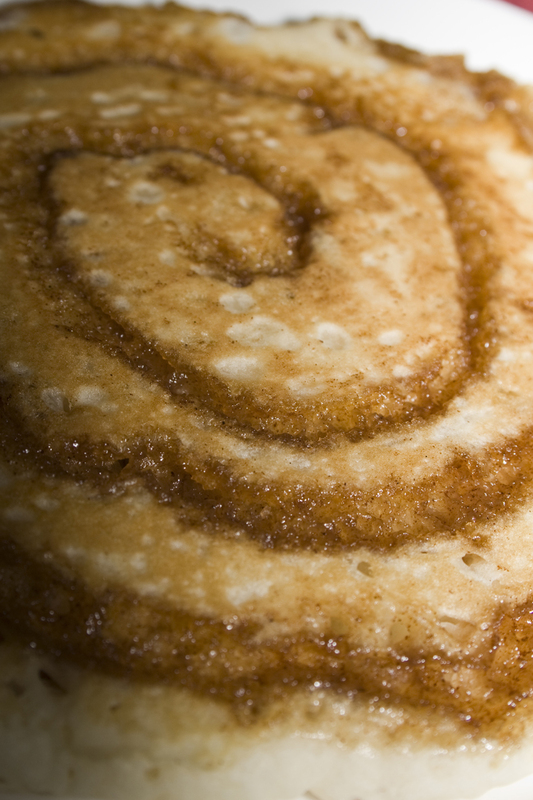 Swirl cinnamon butter around the pancake starting along the outside, moving to the center. Flip pancake. Allow to cook on other side, then serve. 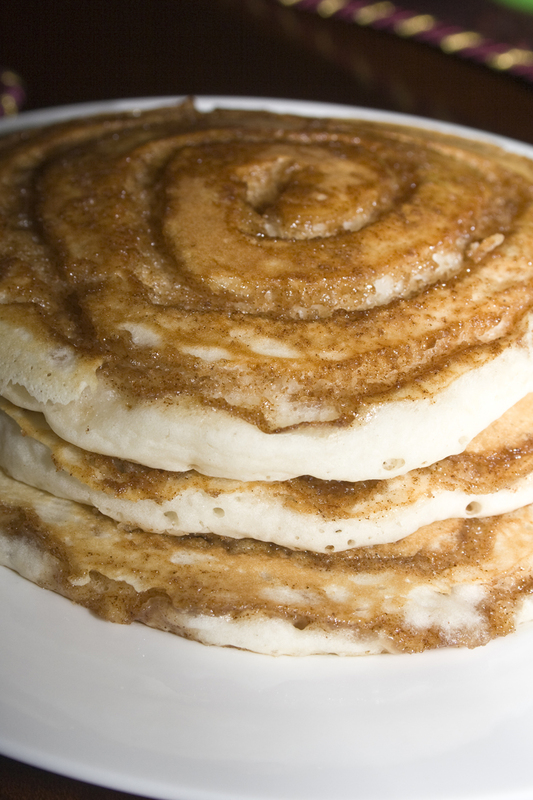 yum.. i will be trying this…we have pancakes every Weekend. Thanks for the idea! You betcha! We have pancakes most weekends. This recipe was a result of trying to find a new way to do them up right! Heavy cream the stuff you use to make homemade whipped cream. I’m still confused on what kinda cream to get for this :/? It will be in the same section as the milk. It will say Heavy Cream on the front. Glad they were devoured! Enjoy finding other deliciousness! Yes, your sauce will just be a little thinner. Thank you so uch for this creative idea on pancakes!! My kids will love them!! You are welcome! I’m sure your kids will!! Mine sure do! We had these for dinner last night (along with eggs, bacon, and orange slices)… dinner for breakfast never tasted so good!! Thanks! Thanks for the heads up. I’ve sent them a request to credit me. It’ll be thinner, but the taste will still be close.